by The Mechanic's Wife | Oct 5, 2016 | Did You Know? On every corner of every street in every city across the country, you will find an automotive mechanic. Each has his own reason for going into the industry. Each has his own reason for staying in the industry (not an easy thing to do!). Each has his own training and experience from which each takes away his own skills, his own ability, his own work ethic, and his own ambitions. At the end of the workday, they’ve all been servicing vehicles. They are all mechanics. Or is that all they are? There’s a difference between “getting the job out of the door” and working with an approach of craftsmanship. Both approaches “get the job out,” but craftsmanship, while it usually takes longer, yields better long term results. Automotive mechanics is a really tough industry to work in. Therefore, you will find very few craftsmen (simply surviving in the industry is hard enough!). For Andrew and Mike, being a craftsman isn’t about scoring high on a special certification test. It’s about leaning on the three mainstays an automotive craftsman needs to maintain quality work. The first of these mainstays is the knowledge and experience derived from a quality education and the dedication to continuing education and growth. It all started in the Technician Automotive Career Training Program at Seminole State College where their teacher, Roger Bennett, taught them how to troubleshoot problems in a logical and fundamental way. Mike also appreciated the real-world application incorporated into class; the opportunity to work on people’s actual cars with actual problems rather than simulated situations. After morning classes, he went to work in an auto repair shop, which helped him solidify what he was learning in the classroom. “Rather than throw parts at a problem, I can figure out what’s really wrong with it and replace the failed part the first time,” Mike concludes. They then built their resumes with a variety of experience working at small independent shops to large dealerships, often side-by-side. Through these experiences they used their knowledge learned in the classroom to hone their craft. The second mainstay of a craftsman is the inclination to access the proper tools and resources available to him. 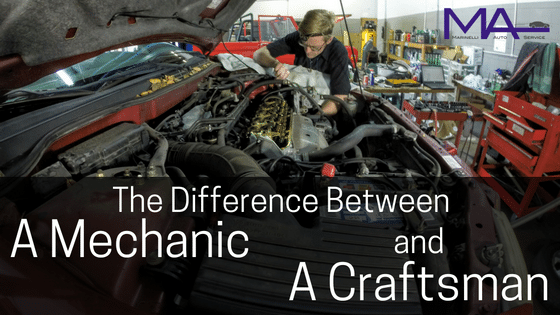 In the jobs they held following their schooling, Mike and Andrew worked alongside dozens of other mechanics between the two of them; few of whom seemed to hold the same values for quality and detail in their work. Andrew and Mike saw guys cutting corners, turning a blind eye, and ignoring precision. That’s not the kind of mechanic they wanted to be. They wanted to be thorough in their work and know that they did each job with the time and attention to detail it deserved so that the customer could drive away with confidence in a sound vehicle. To accomplish this, they continually invest time and money in the proper tools. They also access knowledge databases to research the correct parts and procedures to complete the job the right way. More than that, they lean on one-another. Auto repair is a continual game of problem solving and having to adapt for each specific job. So, it’s helpful for each of them to have a second set of eyes on the problem. Mike may have a trick that Andrew doesn’t know about and visa-versa. By leaning on one another, Mike says it’s like they are multiplying their experience, expanding the chance they’ll get it right. They also lean on me to lead them in running the office efficiently so they can focus on the vehicles. Andrew and Mike can, at times, communicate better with the cars they fix than the people who own them. Andrew regularly invites me into conversations with customers so that when he gets too technical, I can rephrase things in a more basic way. The International Automotive Technician’s Network (iATN) is one of the most valuable resources Mike and Andrew consider. Through iATN, instead of having just one other person to lean on, they have hundreds of technicians and shop owners across the country who weigh in on different aspects of the industry whether it’s advice and opinions on parts, labor practices, repair procedures, or shop management. Through IATN, you can find people, like Andrew and Mike, who are aiming to be craftsmen of the trade. I also use iATN to get ideas and feedback on administration and navigating the people side of our business. Finally, there’s Identifix. This online database provides repair information, specifications, and wiring diagrams for each vehicle we work on. Identifix also has information from the manufacturer and access to highly experienced technicians who provide diagnostic procedures that make smarter use of time than some of the original factory information. “I use the information [from Identifix] to not only get an idea of what the problem might be but also how the system works so I have a comprehensive understanding of what I am working with,” Mike explains. This wealth of information is so valuable to a craftsman but can often be misused by mechanics. “For example,” Andrew expounds, “they read on Identifix that a certain part is known to fail, so they automatically assume that’s what needs to be replaced without doing any further testing.” For Andrew and Mike it’s a great tool to be in used in conjunction with other tools and resources, not a shortcut. And that’s what separates them from the pack. The third mainstay of a craftsman is his heart, that is, his internal drive to get the job done and to do it well. 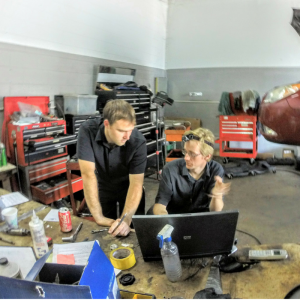 In the time they worked alongside these dozens of other automotive technicians, Andrew and Mike often noticed a lack of concern for how their shoddy standards would affect the people driving the vehicles they were fixing. They also saw business owners treating their technicians poorly and, at times, their customers as well. Andrew and Mike became frustrated with the industry and talked about how they would like to make it better, if only for the few people the two of them could serve. Their desire was to help people – to truly help them. 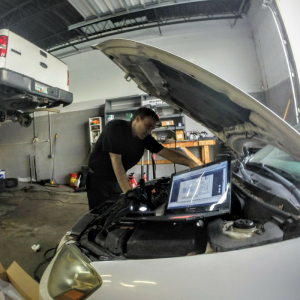 The vehicles we service are not just machines with metal, wires, hoses, fluids, etc… . They are driven by people who have stories and lives and goals and dreams. 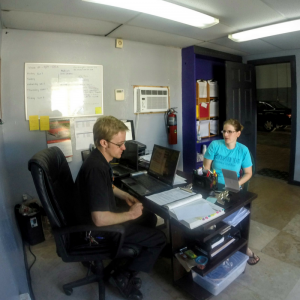 Marinelli Auto Service was a business birthed on a foundation of quality parts, quality work, and quality service. Created to allow room for the craftsman to apply his knowledge, skill, and resources to the honorable service of people who deserve value; people who are investing in keeping their vehicle running so they can live worry free. By servicing their vehicles with a craftsman’s approach, we are helping these people impact their families, schools, workplaces, and communities.